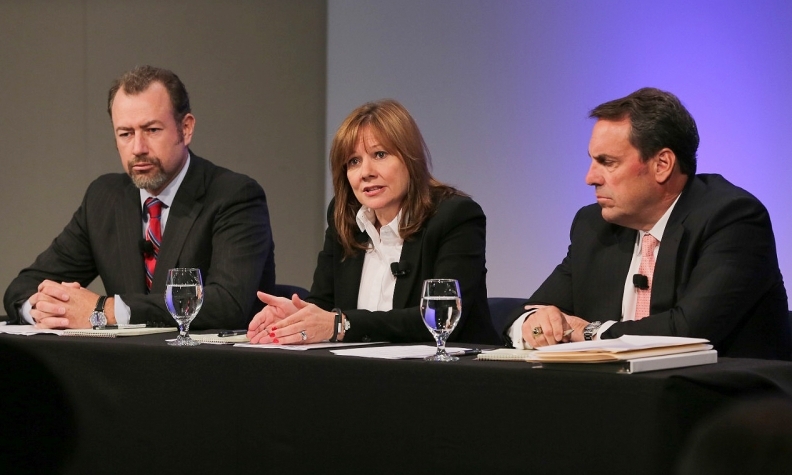 GM President Dan Ammann, left, CEO Mary Barra, middle, and Executive Vice President Mark Reuss, right, answer questions from journalists Thursday after the release of a scathing report. Barra said a "history of failures" inside the company led to the delayed recall of millions of cars with defective ignition switches. WASHINGTON -- General Motors engineers knew the ignition switch in the Chevrolet Cobalt could be bumped out of position, cutting the engine, according to former U.S. attorney Anton Valukas’ report. To them, the ignition switch didn't necessarily present a safety risk to customers -- though safety advocates and U.S. auto safety regulators might disagree. The bigger risk, that cutting off the engine would cut off the airbags in the event of a crash, escaped the notice of GM's engineers and investigators. And that, according to the Valukas report, is the chief reason the ignition switch complaints were classified as a mere customer satisfaction concern, not a safety problem, and became buried in GM's bureaucracy for years. "In short, we misdiagnosed the problem from the beginning," GM CEO Mary Barra said Thursday during a town hall meeting in suburban Detroit. GM intentionally designed the airbag system not to deploy with the switch turned into the off or accessory position – "a deliberate and sensible decision made to prevent passengers from being injured by airbags in parked cars," the report says. When the first case of stalling occurred in 2001, during development of the Cobalt, engineer Jim Sewell noted that the stall would cut off the airbags. He told Valukas’ investigators that he knew the connection. Yet, this fact never filtered out, even though at several different points over the ensuring years, outside groups tried to bring that connection to GM’s attention. It happened twice in 2007 alone, when GM received warnings from a Wisconsin state trooper and a research team at Indiana University that stalls could be turning off the airbags.